FIND, Inc. - BUFSA: Mabuhay! ﻿BUFSA is a member of District One of FIND, Inc. Started in 1993, FIND, or the Filipino Intercollegiate Networking Dialogue, aims to promote unity and cooperation of Filipino students. Its goals are to offer a channel for dialogue and action, to promote and preserve Filipino culture, to further awareness of issues pertinent to the Filipino community, and to offer support to Filipinos studying at institutions on the East Coast. It is made up of collegiate organizations dedicated to promoting awareness of issues pertaining to Filipinos nationwide, preserving and promoting Filipino culture, and providing the means for initiating action and dialogue within the community. District One consists of a region extending from northern New England to the Greater Boston area and Rhode Island. 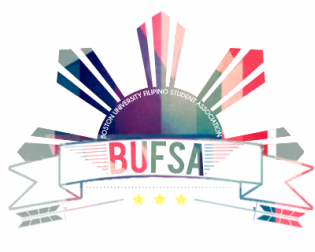 In addition to BUFSA, it includes clubs such as the Philippine Society of Boston College (PSBC), Northeastern's Barkada, the Harvard Philippine Forum (HPF), Brown's Filipino Alliance (FA), Wellesley Club Filipina, and UMass Boston Hoy Pinoy.